This is one pork adobo with a twist that is why it is called browned pork adobo. The cooking method is slightly different from the ordinary pork adobo but all the ingredients are basically the same. Frying the pork belly until brown is included in the procedure of cooking this adobo and not just throwing everything in the pot and fire up the stove. I was having a problem before how will I name this adobo because what I have in mind is “braising” which is also browning or searing the meat in fat before slow cooking, but cooking adobo need not to be cooked slow specially the pork belly which is easy to tenderize. Braising is only for tough cuts of meat that should be cooked in a pressure cooker or slow cooking. 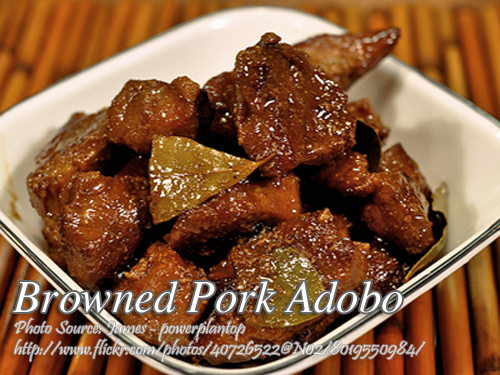 This is one pork adobo with a twist that is why it is called browned pork adobo. Combine the pork belly, garlic, peppercorns, and laurel leaf in a pot. Pour water just enough to cover the pork and simmer until pork is tender. Pour in vinegar and a pinch of salt then continue simmering until the broth is thickened. Pour the broth into a bowl and set aside leaving the pork in the pot. Add oil to the pork and fry until the meat is brown and the fat is slightly toasted. Pour in soy sauce and stir cook for a few minutes. Return the broth to the meat and let simmer for 1 minute. Hi Tanya, I’m glad you liked the browned pork adobo.